It was Bob Dylan's birthday the other day, and I had the pleasure to attend a tribute performance of his songs , featuring a curious mix of renditions of obscure Dylan songs and versions of more familiar ones that were, in a word, problematic. The gathered performers, singer-songwriters all who obviously feel their debt to the iconic man is something that they cannot repay in full, obviously had fun with their choices and their occasionally idiosyncratic arrangements. The results were mostly enjoyable, although there continues to be the knee jerk habit of praising Dylan's songwriting beyond good sense. Dylan has been in the music game since the early sixties, his influence on other performers is second only to the Beatles for the unalterable game change he brought to rock and pop music, and it's astounding that that through the decades, weathering fads, trends and several years of bad road, he remains relevant. But that he remains a touchstone younger generations model themselves after isn't the same that everything he's written is equal to the best work; some of it is , in fact, slapdash, repetitive, and unconvincing as narrative vehicles. It's often pointed out by critics and the occasional academic like Christopher Hicks that Dylan's writing shares with legitimately Canonical figures like Pope and Milton a life's work that reveals the gathering perspective of one who has outlived their foolishness and impulsive certitude; perhaps, Dylan remains a songwriter, not a poet , and his lyrics are locked into the bare chord essentials that have been his preference since "The Freewheelin' Bob Dylan". His melodic range is limited, and part of the problem with the weakest of his later songs is that there isn't musical cue to give the artist a hint of when to wrap up his subject. Instead, one chorus follows another , with little variety in a song's melodic logic to indicate when a subtler, terser phrase is needed, when a more vivid refrain is required. A consistent tension between melody and lyric creates interest, and makes lyrics quotable. Too much of latter day Dylan is not quotable, but are, rather, prolix, a longish bit of daydreaming in the vaguest of locales. The vagueness would be fine if there were a more evocative word selection, but too often Dylan writes what seems like an interesting commencement upon an intriguing passage, only to quickly bury it with insipid qualifiers and disposable asides. What I keep wondering is whether if Dylan had advanced his musical vocabulary--The Beatles had, The Rolling Stones had, Elvis Costello had, Dylan acolytes all--would his lyric chops likewise seen an elevation in quality and variety? While pondering that at the concert, a performer on stage was attempting a version of "Like a Rolling Stone", a miserable experience. It came off more as a Ricky Lee Jones parody than a tribute to Dylan, with an arrhythmic mix and match of tempos and grating blues inflections and melismatic improvisations on the famously acerbic words that made no connection with the surreal rant that is at the song's center. It was an indecisive version, full of stops and starts and wasted vocal gestures--voice and guitar seemed not to know what the other was doing; it was like watching someone try to park too large a car in too small a space. Dylan's best songs deserve better. Discussions about the merit of Bob Dylan’s music go back to at least 1978, when I recall a debate in the pages of the Guardian about whether the man who once said that he needed “a dump truck to unload (his) head” now only required a shovel and a roll of toilet paper. The debate still goes on – and books like Sean Wilentz’s new tome continue to be written -- because Dylan is the one essential songwriter of the last 45 years. This is not to say that his work has been consistently the best. It hasn’t. Actually, wild inconsistencies of quality seem to be the hallmark of artistic innovators, particularly in pop music. Far be it from me to defend such Dylan albums as Down in the Groove or Under a Red Sky. I will be the first to admit that songs like “If Dogs Run Free” or “Wiggle Wiggle” have not held up well over the years. But the growth of popular music (and the deepening of its lyric content) is simply unimaginable without Brother Bob. He is the one indispensable figure. This is why he is a touchstone for younger generations of acolytes and imitators. There is so much in his catalogue to discover – and there are things to learn even from the bad stuff. The issue of whether Dylan would benefit from a wider musical vocabulary is tricky to delve into. He himself has commented that it is his words, not his music that will be remembered. Of course, he borrowed folk tunes outright in his early days and his recent work sticks closely to familiar traditional modes. Then again, would the best of his writing have retained its urgency and otherworldly power if it had been set to elegant jazz stylings or stitched onto a Broadway framework? Could even a Sondheim have done much for Bobby Z.? Elvis Costello’s ill-advised experiments with string quartets and the like suggest that singer/songwriters who venture beyond folk, blues and country-based forms do so at their peril. Think also of Joni Mitchell’s forays into the misty regions of jazz in the ‘70s. Did such ambitious exercises really serve them well, particularly as lyricists? I’m kind of glad I didn’t hear the painful real-time dismantling of “Like a Rolling Stone” you mentioned. There have been weird and sometimes embarrassing reworkings of Dylan songs for generations now –e.g. William Shatner’s cover of “Mr. 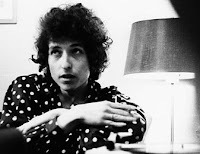 Tambourine Man” or, better yet, Sebastian Cabot’s prim (and oddly effective) reading of “Like a Rolling Stone.” This testifies to Dylan’s durability and relevance, I think. Just about every singer has had his or her Rendezvous with Bob. Apparently, the question “how does it feel?” needs to be answered again and again. So yes, I still think he still needs that dumptruck. I’d agree that Costello has spread himself too thin in his efforts to become the most versatile rock songwriter of his generation, but what has diluted his later work isn’t variety so much as ambition. His work was already diverse in the styles it employed—Motown, gospel, Brill building power-sob-ballading, folk traditions, guitar-centered rock power chording, effortlessly melodic and melancholy ballads—a habit gained from his other principle influence, the Beatles, and as the wide swath of approaches has given him to write an amazingly solid set of poetic/obscure/ brilliantly hard nosed lyrics that could accommodate several themes and sub textualities in the span of a fully realized composition. Doubtless the dips, curves and marvelously detailed turns of the songs forced him to work a mite harder with a lyric. Some of it was, of course, a grueling strangeness that was more alienating than alienated, but the records he produced from My Aim is True through Imperial Bedroom were overall a dazzling array of stanzas and catchy choruses that would seduce the sensibility in a masterful variety of styles. Costello, though, is a pop songwriter for all the subtlety his music contains, and he been seduced by the notion that he should be an artiste— as the pieces got longer, the styles more far fetched, the variety more dress-up make believe than convinced of its own primacy, the good man reveals himself a talented musician in a hurry for a more impressive reputation. What I think Dylan would have benefited from is the sort of range the earlier work of Costello shared; his lyrics would have been been sharper more often.